In a sense, Oregon’s physical positioning between California and Washington is analogous of its attitude towards gambling and legal real money Internet poker. In a phrase, OR, the Beaver State, is sandwiched in the middle. Whereas California recently introduced two online poker websites bills to legislature , Washington has embraced one of the strictest anti-iGaming Internet poker betting positions in the nation. Oregon walks the proverbial fence of lawful Internet poker, tending slightly towards Washington in its harsh anti real money betting beliefs. But while OR has enacted policies against online Internet poker operators conducting real money poker gambling transactions, there have been indicators that Oregon supports gambling and poker betting expansion too. All State laws aside, Beaver State gamblers will be able to sign up for a real money US poker site. 3 Can Players From Oregon Play Online Poker? 4 Legality of Online Poker in Oregon? After failing the first time around, Oregon is taking a more tepid approach towards bringing its real cash gambling statewide lottery online . To date, the closest Oregon comes to offering players a virtual gambling or Internet betting experience are live Internet-based keno broadcasts. But a quick glance at the state’s five year plan indicates that the real money Oregon Lottery will be making a strong push to reinvent itself on the web via Internet real cash gambling, with the goal of appealing to entirely different people and OR betting fans. Notably, Oregon Lottery spokesman Chuck Baumann sees an online lottery as an entry path to Internet gaming and possibly legal real money poker websites by first taking Lottery gambling to the Internet. The problem is, the Oregon’s real cash lottery doesn’t allow for the sale of Internet poker-related products online. Of late, real money poker website companies that produce games like Internet Texas Hold’em poker are aligning themselves with Internet gambling operators and are placing themselves in an excellent position to provide a full suite of online gambling services and real money poker games. Current Oregon Governor John Kitzhaber is vocally opposed to online gambling, and lawful Internet poker real cash betting, yet his actions suggest otherwise. As a Senator, Kitzhaber lobbied to legalize video poker gambling. And while in his first go-around as OR governor, he opposed electronic slots, he would eventually support the Lottery’s plan to replace 12,000 machines. The Oregon Lottery’s plan incorporates the terms convenience, more social, more technologically relevant and younger into its language, strongly inferring that the plan is to bring the lottery online by 2019. These are all words that could be used to describe a move into providing legit real money poker websites too. A previous attempt to bring real cash lottery gambling to the Internet was marred with issues, not the least of which was that it inadvertently targeted underage players in OR. If Oregon successfully brings the lottery online, a proper Internet gambling regulatory oversight committee would already be in place. Whether that’s enough to compel Oregon’s state officials to draft an iGaming Internet poker bill for legal real cash poker websites is currently unknown. Can Players From Oregon Play Online Poker? Oregon’s anti-iGaming and anti-poker betting laws prohibit iGaming Internet poker website operators from accepting lawful poker payment over the Internet. However, because most real cash poker operators are based outside the US, pursuing them would be an arduous, if not impossible, task. That being said, players from the Beaver State should have little trouble creating an account on one of the real money US poker websites. The signup process is as straightforward as it gets. Merely enter in a few relevant details, deposit funds using one of a myriad of available options and you’ll be well on your way to check raising fish in real money poker betting games like Texas Hold’em. 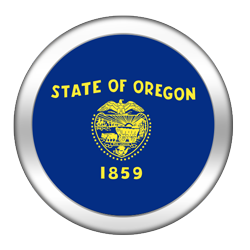 Legality of Online Poker in Oregon? Here’s where we run into a bit of a quagmire. According to the Material test, any gambling game where chance plays a role in determining an outcome is deemed a chance game under Oregon law. Also, notice that the term element of chance implies that chance does not need to be a determining factor, as it is in real cash poker. Given that the turn of a card can make or break a real money poker player’s session, it is assumed that poker gambling would indeed be classified by Oregon law as betting on a contest of chance, and therefore gambling. A game, other than a lottery, between players in a private home where no house player, house bank or house odds exist and there is no house income from the operation of the social game. According to Oregon law, if players participate in a raked real money poker game, everyone loses, including the house. Poker gambling and real cash betting operators can be charged with ever more severe penalties. Anyone that knowingly promotes or profits from unlawful gambling, is subject to a Class C felony. In addition to paying exorbitant fines, operators can go to an Oregon jail for upwards of five years. In other words, you should think twice about raking a couple of bucks from each real money poker pot. Furthermore, the law touts an entire subsection solely dedicated to Internet gambling and real cash poker betting websites. However, the scope of the law is limited to Internet poker operators that knowingly accept, in connection with the participation of another person in unlawful gambling using the Internet: credit cards, electronic fund transfers, checks or really any other form of real cash payment. The charges for violating this policy are in line with those for live real money poker operators – a Class C felony. However, no mention of gambling poker players is made in conjunction with the state’s Internet poker and gambling laws, leaving the legality playing online poker at Internet poker websites partially unclear. We recommend that you talk to your legal advisor for further guidance about legal Internet poker in Oregon, equipping yourself first with further knowledge of Oregon’s revised gambling and betting statues , accessible via our “References” section. As early as the mid 1800s, residents seeking a better life, and sometimes real money fortune, would make the 2,000 mile trek from the Missouri River all the way to central Oregon. The aptly titled Oregon Trail  serviced approximately 400,000 settlers in those days, some of whom would become the state’s first gamblers and real cash poker players. Due to the corruption of Oregon’s law enforcement officials, including the state’s first police chief James Lappeus, and Oregon’s status as a newly-minted state, gamblers looking for action experienced very little resistance in their hunt for lawful real money poker games like Texas Hold’em poker. Saloons and other gambling houses popped up everywhere, some of which quickly became a Mecca of gambling activity for poker betting enthusiasts. Lappeus himself was notorious for owning a gambling house and at least rumored to have committed several heinous crimes nearby the real money poker tables. By the 1920s, the poker gambling situation was spiraling out of control. At the time, Chinese gangs were running Oregon’s black market, offering a variety of pleasures including real cash poker to anyone looking to satiate their dark urges. One particular event in April 1922 prompted OR District Attorney Stanley Myers to conduct his historic raid on Chinatown. With nearly 60 search warrants in hand, Myers led what seemed like every law enforcement official in the state on a search to unearth illegal gambling halls and real money poker rooms. From that point forward, illicit gambling and poker betting activities were notably subdued. Fast-forward 60 some-odd years later and real cash gambling would once again become a fixture in Oregon culture, albeit this time in regulated, legal gambling form. In 1984 OR voters approved a statewide real money lottery, followed in 1989 by the legalization of real money gambling on sports-betting in 1989. The Sports Action lottery was the first form of legal, state-operated sports-betting in the United States. By 1992, video lottery terminals were legalized, and over the course of the next 12 years, over 2,000 bars would equip their facilities with over 10,000 lottery-operated real money betting machines. Then, in 1994 the Oregon State’s tribal factions began opening casinos and real cash poker venues. This was made possible by a federal mandate entitled the Indian Gaming Regulatory Act of 1988. To date, nine tribal casinos and real money poker gambling rooms operate on Indian reservations, many of which host casino style table games, Texas Hold’em poker included. In lieu of the sweeping changes, the Oregon Lottery raked in over $1 billion in real cash betting revenue from 2005-2006, providing much needed financial resources to the state’s schools, parks and towards business development . In addition to the OR state’s nine tribal casinos and real cash poker betting facilities and the lottery, residents are permitted to wager real money on horse races. Charitable gambling is also legal, and includes Monte Carlo or casino nights, with real money poker games. The only form of gambling not regulated by the state of Oregon is commercial casinos and lawful poker rooms. Although online poker is illegal in Oregon, online poker sites are easily accessible to players in the Beaver State. There’s been little word on when or if Oregon will open up iGaming Internet poker discussions. However, given the Lottery’s powerful presence and huge annual real cash betting revenue take, it would be hard to imagine Oregon’s state officials not at least exploring the topic of legal real money poker websites in OR, especially if California enters the fray. That being said, the state’s tribal factions would likely oppose any iGaming Internet poker legislature, fearing that legalized Internet gambling and real cash poker websites would pose a threat to their thriving casino and poker gambling industry. The lack of commercial casinos in Oregon also doesn’t bode well for its Internet poker chances either. And then there’s the gambling law which strictly prohibits real money poker operators from conducting unlawful gambling and betting activities. Granted, if Internet gambling and legal poker websites were regulated and legit, it would no longer be considered unlawful, but just the presence of an anti-iGaming law aimed at stopping Internet poker betting raises doubts. In March 2014, Chinook Winds Casino Resort played host to a stop on the Deepstacks Poker Tour . The Main Event featured a $1,000 + $100 real cash poker buy-in and a guaranteed $150,000 in poker gambling prize money. Should an iGaming Internet poker bill be drafted, Oregon’s pro-iGaming legit poker website proponents will likely face significant challenges from both Indian tribes and current OR Governor John Kitzhaber. Still, the most influential staple of Oregon’s gambling and real cash betting industry, the Oregon Lottery, seems all for pushing forward with real money Internet gambling. Time will ultimately tell, but we’d gauge Oregon’s chances of eventually penning an Internet poker gambling act for legal real cash poker websites as above average.